RALEIGH — June 25, 2018— Miller Monroe & Plyler, PLLC is pleased to announce that Paul T. Flick has joined the firm’s litigation practice effective May 1, 2018. Paul is a graduate of Wake Forest University (B.A. ’83) and the Wake Forest University School of Law (J.D. ‘86). Except for a 2-year stint, Paul has spent his entire career with the venerable Raleigh firm of Jordan Price Wall Gray Jones & Carlton, PLLC, serving as the firm’s Managing Partner from 2002 to 2017. Paul primarily practices in areas of business and commercial litigation, mediation, arbitration, and administrative law. He represents business clients in a variety of matters, including shareholder and LLC member litigation, contract disputes, commercial fraud, unfair and deceptive trade practices, business collections, and creditor’s rights claims in bankruptcy. Paul is a NCDRC Certified Civil Superior Court Mediator, concentrating in mediating business disputes. He is a frequent lecturer and has written numerous articles on legal ethics, civil practice, mediation, and the rights of creditors. Since 2002, Paul has been rated “AV” by Martindale-Hubbell, which is the highest rating for qualifications and ethical standards. 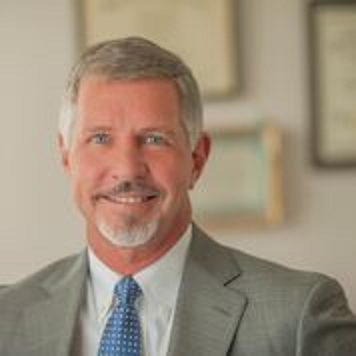 He was also selected for inclusion to the list of “Super Lawyers” in the field of business litigation in 2018 and to Business North Carolina magazine’s Legal Elite list in litigation in 2013 and 2016. “Paul Flick is widely regarded as one of the top business litigators in the Triangle. He has a broad array of commercial litigation experience – from complex partnership disputes to bank litigation to commercial contract disputes and everything in between. More importantly, his quality of character and impeccable reputation for honesty and integrity fit squarely with the core values of our firm,” said Jason Miller, Partner, Miller Monroe & Plyler. Paul’s notable clients have included national lenders, mortgage services, and regional banks on creditor’s rights matters throughout North Carolina, technology companies in complex minority shareholder matters, and international corporations in large arbitration matters. Paul has served as an Administrative Hearing Officer for North Carolina Board of Nursing since 1999. He is a Council Member of the North Carolina Bar Association’s Dispute Resolution Section and has been a member of the Wake County Bar Association’s Fee Dispute Committee since 2014. “We are incredibly honored to have Paul join our team. He is a skilled and experienced business litigator who always puts his clients first. He will be a tremendous asset to our clients and our firm,” added Jeff Monroe, Partner. Paul is married to Lesa Turner Flick, and between them, they share four remarkable adult children. They enjoy getting away to their cabin on the Pamlico River and any gathering with family and friends. When not working, Paul enjoys hitting tennis balls, running and live sporting and music events. With Miller Monroe & Plyler, Paul will continue to focus his practice on business and commercial litigation and administrative law. He will also continue to grow his mediation practice. Founded in 2009, Miller Monroe & Plyler is a civil litigation firm serving corporations, small businesses, and individuals in the Raleigh, Durham, and Chapel Hill areas, and throughout the State of North Carolina. The firm’s primary practice areas include commercial litigation, construction litigation, personal injury and wrongful death, estate litigation, creditor’s rights – bankruptcy, and general civil litigation matters.